A groundbreaking ceremony was held for Gilbert’s Mega Park recently. (L-R) are Jacob Ellis, deputy town manager; Patrick Banger, town manager; Brigette Peterson, vice mayor; Jordan Ray, councilmember; Jenn Daniels, mayor; Eddie Cook, councilmember; Denny Barney, Maricopa County supervisor District 1; Rod Buchanan, former Parks and Recreation director. 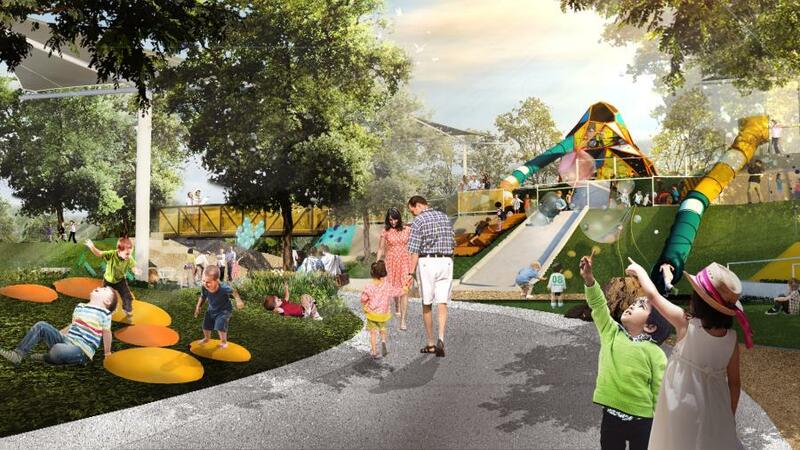 Construction is set to start in September on a projected $100 million three-phase park in Gilbert, Ariz., that starts out big and through multiple phases, gets even bigger. The “mega-park” will be located near Higley and Queen Creek roads. Planners spent two years work designing the first 30 acres of the new regional park. The original master plan for Gilbert Regional Park was completed by Kimley Horn, based in Raleigh, N.C. The 30 acres of park currently under design was a combination of town staff, Dig Studio of Denver, and Marc Taylor Inc. of Phoenix. Phase 1 of the four-phase project will cost $16.8 million dollars. Although a groundbreaking ceremony was held recently, major construction of Phase 1 is scheduled to begin in September of 2018. The full 272 acres does not have a completion date until a funding source has been identified. The first phase of the park will open in September of 2019. The town of Gilbert is poised to be the suburb of the future and the city sees the park as a needed facility to serve a growing population. Ultimately the park will span 272 acres. It will eventually have 7.1 mi. of trails as a regional park. 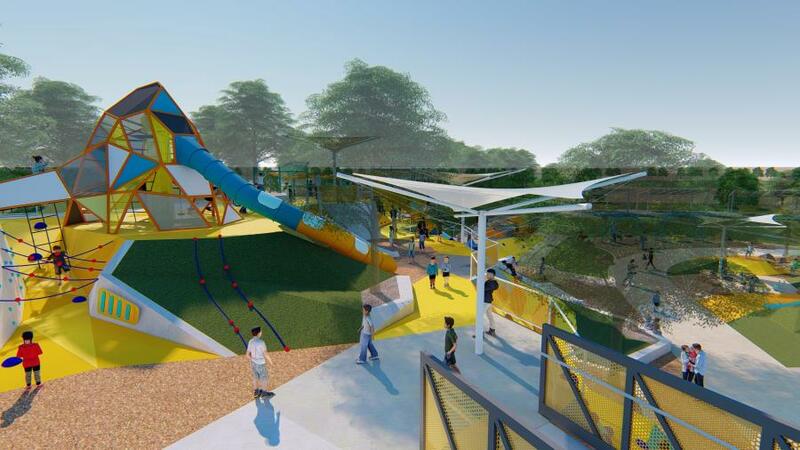 The vision is to incorporate multiple slides, climbing structures, splash pad fountains and water features. Construction crews also will construct pickleball and tennis courts as part of the first phase of construction, with a playground as the centerpiece of the new park. Gilbert Regional Park is designed to draw visitors from all over the Phoenix Metro Area. They will be attracted to the unique playgrounds and future special events. The $100 million cost of building the park will be spread over the course of five to ten years. A ribbon cutting ceremony will be held to kick off construction of the first 30 acres of the park in September. Then crews will begin construction on 20 more acres. 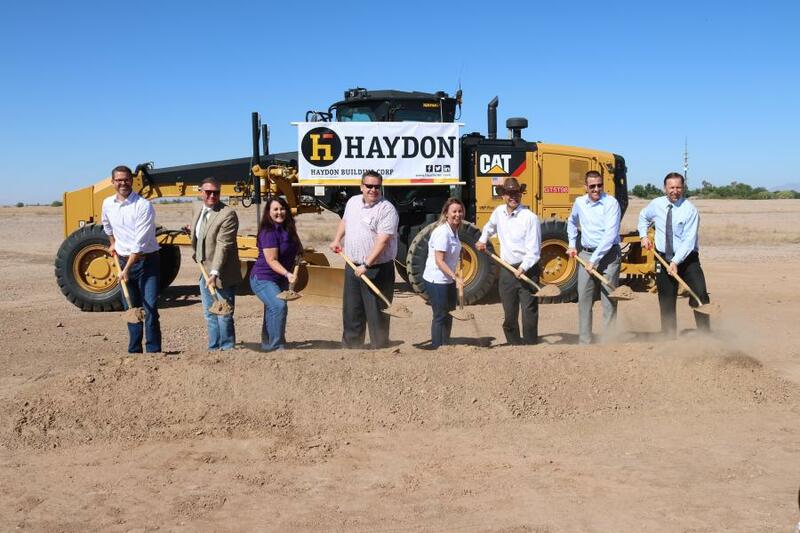 Haydon Building Corp. of Phoenix is contractor for the project. The park project is a CMAR project, also known as a Construction Manager at Risk project that entails a commitment by the construction manager to deliver the project within a guaranteed maximum price, which is based on the construction documents and specifications at the time of the GMP plus any reasonably inferred items or tasks. Haydon will be in charge of construction for the project and will manage all dust control and minimize noise. For Phase 1 of the project one entry road to the park will be constructed. Haydon has completed previous work for the town, Carmona said. This summer, the town council will vote on an official name for the park and the community will be invited to weigh in. Subcontractors have not yet been selected for the project. The first phase of construction will be paid for through capital improvement funds, park development fees and land sales already approved by voters. A bond measure in 2024 also is a possibility. The city also is counting on generating money through sports court rentals for tournaments, concerts in the amphitheater and a wedding space near the lake. The park will include partnerships between the town and private organizations. The goal is to add something to the community recreation mix that Gilbert doesn't already have. The town is looking over responses to a request for proposals from private companies for the park and will soon go into negotiations. Examples of possible public-private partnerships include a water park, a sports academy and an ice rink. The revised plan has five multipurpose fields, four soccer fields, four baseball fields and four softball fields. Constructing that portion of the park will require the relocation of 2.5 million cu. yds. of dirt, according to reports, which could take up to three years. In the final design, aquatic and recreation centers previously presented as separate amenities are combined into one 100,000-sq.-ft. facility. The Gilbert Parks and Recreation Department reached out to the community in different ways to gather input including the items below. The Parks & Recreation Master Plan developed in 2014 calls for playgrounds, trails, special events, swimming and gym/fitness spaces. The top five recreation spending priorities include trails, aquatic facilities, recreational centers, parks and lighted fields. A survey was taken among the Gilbert Community in 2014. Of those who answered, the most important potential park and recreation offerings are trails, year-round Aquatic Center, sport fields and a multi-use lake. In 2015, a Sports Fields Needs Assessment showed an additional 37 sports fields needed to be built into the system. “The department will go through similar public outreach efforts as mentioned above when the plans for Phase 2 are created and the department will use the original Gilbert Regional Park Master Plan as a guide,” Carmona. Phase 1 and 1B: lake, playground, splash pad, pickleball courts, tennis courts, sand-volleyball courts, turf area, restroom building, parking and infrastructure improvements. Phase 2: recreation and aquatic center, parking, road work, disc-golf course, skate park, bike park, amphitheater, multiuse path, trails and basketball courts. Phase 3: sports fields, amphitheater, playground, ramadas, multiuse path and trail extensions, ropes course, food-truck plaza, great lawn, restroom buildings and road work. Phase 4: Multiuse center, retail and parking. Carmona noted that soil will not need to be brought to the construction site because plenty of soil is available on the park property. 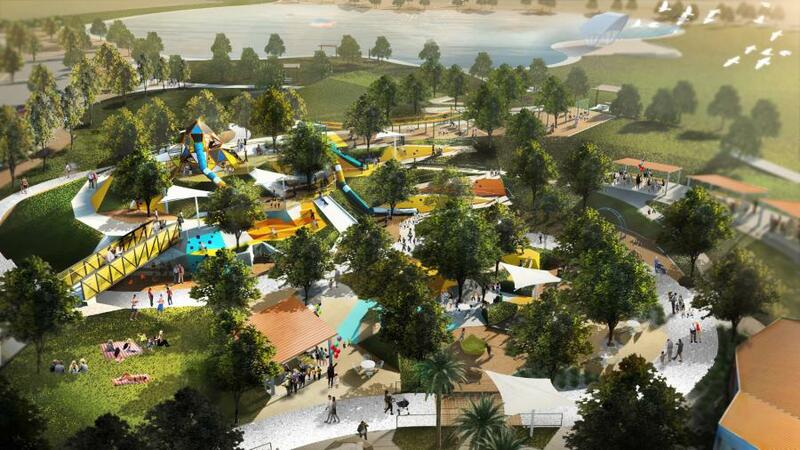 The giant park is expected to provide economic benefits to the Gilbert area.